CVNC quartz crystal tuning fork are produced by high purity quartz crystal, the purity more than 99.99% and produced at least 1800 degree. We have professional technicist and machine to produce the fork, then they will be tested to determine the musical note. Music tuning fork is a kind of music instruments can be used for treatment, which helps practitioner to clarify the mind in order to achieve a state of deep meditation. All the tuning fork are made of high purity quartz crystal, they naturally contain the ability to energize, clear and enhance the energy in any environment, making them incredibly resonant.These tones move through our body in vibrant waves, calming, aligning and healing our energy centers. Growing medical research is validating the powerful use of these tuning fork in balancing and healing the human body, mind and spirit.The crystal singing tuning forks are associated with the musical scale with C,D,E,F,G,A and B, these notes are in turn associated with the seven chakra of human body. 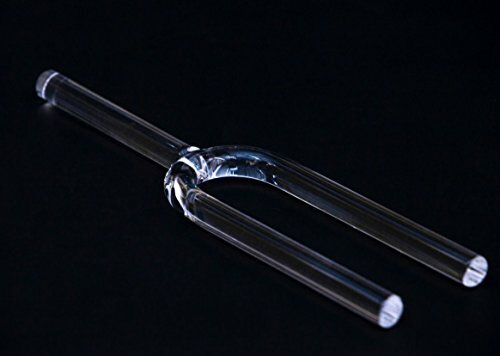 CVNC quartz crystal tuning fork produced by high pure quartz crystal , the purity more than 99.99%, it is an excellent for meditation and healing tool. Beautiful, Clear, Deep, Amazing and Rich Vibrational Resonance with the power to Heal. Each tuning fork is coming with a Free Mallet. Professional safe packing. We will replace by free if there is any damage or missing in transport.Any Question,Please Contact the Seller First. If you have any questions about this product by CVNC, contact us by completing and submitting the form below. If you are looking for a specif part number, please include it with your message.